We love Assiniboine Provincial Park in British Columbia. 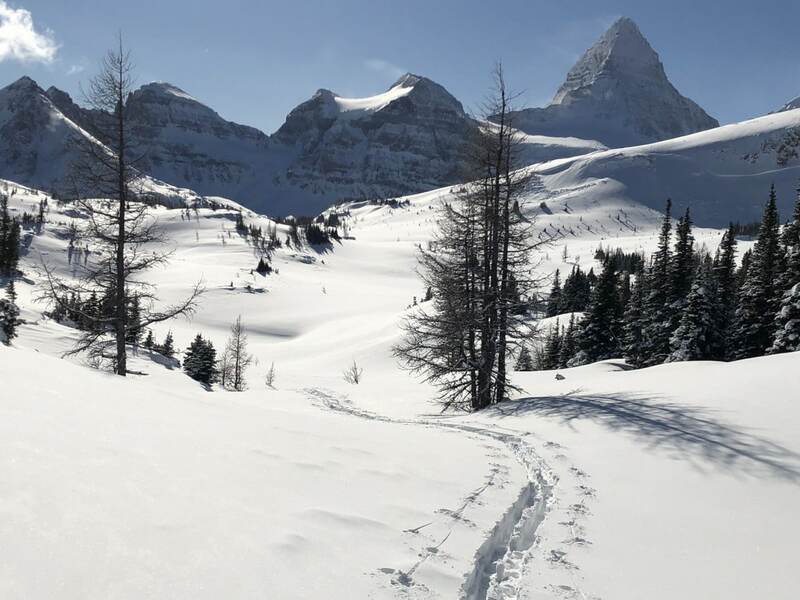 Home to the gigantic Mount Assiniboine, this is truly a winter wonderland, and a trip here should be on everybody’s bucket-list. Luckily Assiniboine has a great mix of accommodation, with the stunning Assiniboine Lodge (and their incredible cabins) and the cheaper, yet still very comfy Naiset Huts. One of the great parts of Assiniboine is you can get there via a helicopter, which makes the 25km+ ski/snowshoe trail unnecessary. We like to take a helicopter to the Assiniboine region from Mt. Shark and then ski-out. The big choice for a winter adventure in Assiniboine is where to stay and for how long. Most people go for anywhere from 2 to 7 nights. We like 3 or 4 nights, as that gives a good time to explore and doesn’t feel rushed. There are only two choices of accommodation at Assiniboine, and you need to reserve in advance as they book up. The Naiset Huts are a low-cost historic gem. Assiniboine Lodge may be one of the most beautiful lodges on earth, and though it is more expensive you’ll find it still good value to stay in a guided, historic, luxury lodge. You’ll need to figure out whether you plan to ski/snowshoe into the region or take a helicopter as you book your helicopter flights when you reserve your accommodations. 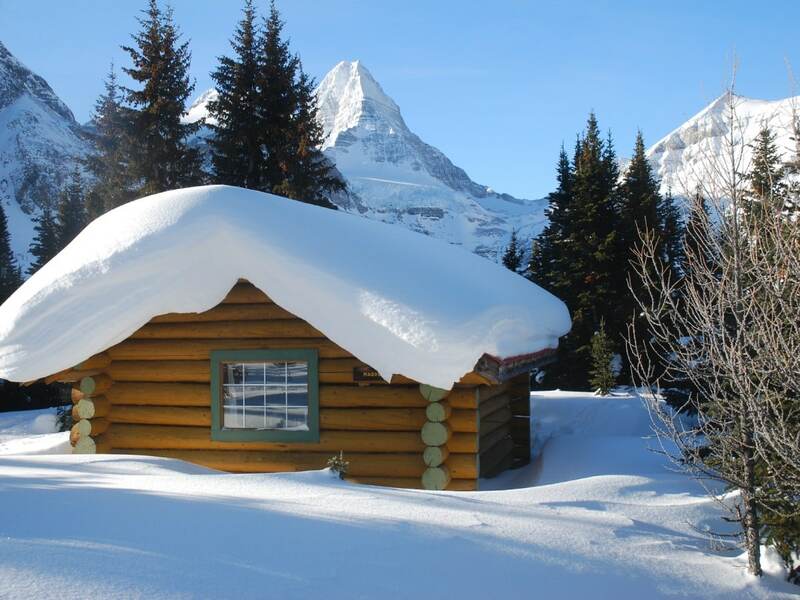 The Naiset Huts are a series of log cabins built by The Alpine Club of Canada in 1925. The cabins range in size and are very rustic. They all have a sleeping mats, a wood stove (you can buy logs at Assiniboine Lodge) and some hooks to hang your gear. The real star of the Naiset Huts is the incredible Wonder Lodge Cooking Shelter – there may be no better cooking shelter in Canada. It is warm. It is clean. It is comfy. It is heaven, especially if you’ve had a cold day skiing and you need to dry your gear. If you feel like a break, you can also ski over to Assiniboine Lodge and grab afternoon tea from 4-5pm. Costs are very cheap at the Naiset Huts, running $25 per night. Logs are $7/each, and we’d recommend 4 per night when it’s cold out. What a deal! Assiniboine Lodge is a rustic-luxury mountain lodge, constructed in 1928 by Erling Strom and the Marquis degli Albizzi. We love the lodge, but the real star are the cabins. They are warm, romantic and private. You just want to spend the day reading and relaxing, however the wonderful scenery will make this impossible, you will need to get out and explore this wonderful region. Assiniboine lodge is incredibly comfortable, and the food is terrific. Your trip includes guided daily trips to safely explore this incredible winter wonderland. All this luxury comes at a cost though, with lodge rooms at $290 per person per night and private cabins for 2 at $355 per person per night. Kids are discounted at $165 per night. Access to the region is either via a long, LONG 25+km ski/snowshoe or helicopter. The helicopter journey is amazing, and for $175 each way it’s worth it for the ride alone. You book your helicopter trip when you book your accommodations. If you chose to ski-in, most people do it in 2 days, with a break at the spartan Bryant Creek Shelter. 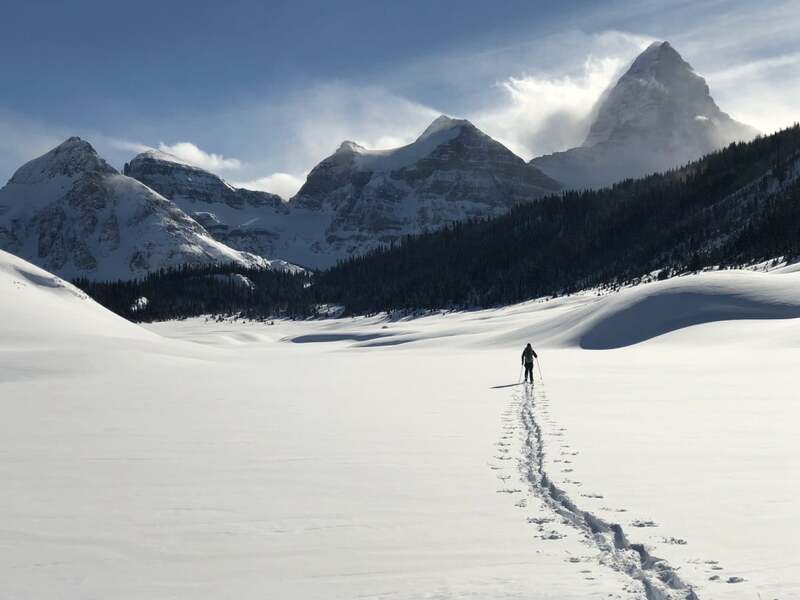 We won’t even try to describe getting to Assiniboine on ski, though you can just reverse our trip out if you do want to ski in. Take the Helicopter. Enjoy the incredible views and spend the time you save exploring the wonderful region more. From the location where the helicopter drops you off, if you’re staying at Assiniboine Lodge you will be taken care of and you only need to follow the directions of the helpful staff. If you’re staying at the Naiset Huts, check-in with the Assiniboine staff and then ski on a trail that goes to the SE to the Naiset Huts. You won’t see the huts until you are almost on top of them. If arriving by air, fly into Calgary and rent a car. The drive to the trailhead is wonderful, and takes about 2h from the airport, though can be longer if it’s snowing. You can drive to the Mount Shark Heliport either via Canmore or Kananaskis Lakes. Either way you need to take the Smith-Dorrien (Hwy 742), which is a gravel road. Drive carefully in winter, it can be icy! Whether you are taking a helicopter or skiing in, you need to get to the trailhead early, and most people stay in Canmore, Banff or Mount Engadine Lodge the night before. There are so many great ski trails in Assiniboine, but not the long, steep descents that are more common in the Selkirks or the Monashees. 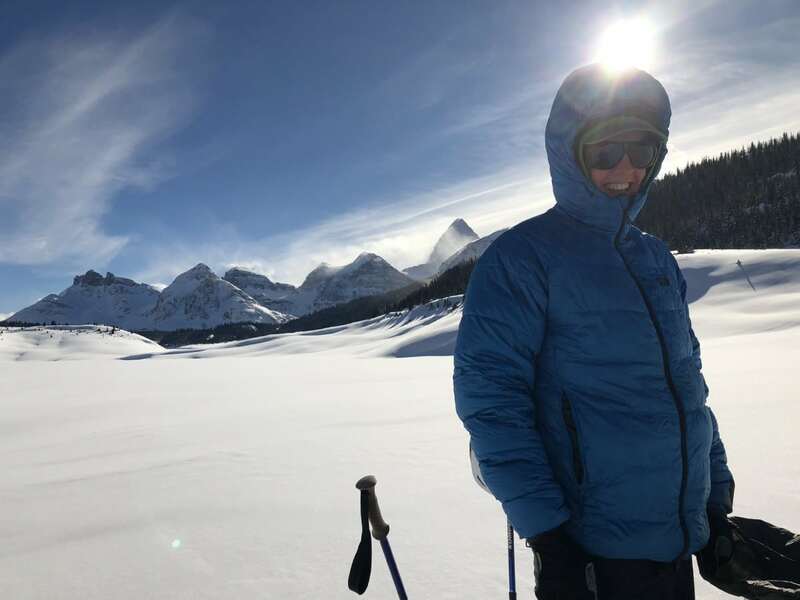 While there are some good places to find turns in the Assiniboine region, we recommend booking at Assiniboine Lodge and letting their guides take you out. They know where to go as well as understand the challenging snowpack in the area. One of our favorite trips is to simply take a ski around Lake Magog from Assiniboine Lodge. The views are incredible, and if you’re lucky to get a bluebird day you could spend hours here enjoying the stunning views. There is usually a comfortable trail on the right-hand side of the lake, where the summer campground is. This is an easy trail but stop before you get below the avalanche chutes of Sunburst Peak. Jones Bench may be our favorite winter tour in the Canadian Rockies. This 12.4 km trip has it all: turns on the Nublet, high-alpine scenery, views of Assiniboine and it’s not as heavily trafficked as other tours in the area. Be aware that if you’re breaking trail and route-finding this can be a longer day. While normally a 4-5h ski-tour, it took us almost 6.5h without a trail to follow. Obviously, you should have avalanche training to go on this ski tour. Our map of the Jones Bench route starts at the Naiset Huts. Head over and past Assiniboine Lodge, going NW from Assiniboine Lodge on a well-trodden track. This trail goes roughly straight while other trails split away to the left. The track then heads up through the trees. You’ll make your way though the trees and come out below The Nublet, a lower-angle sub-peak that is popular for a few turns when snow conditions are right. It takes about 10 minutes to ascend The Nublet and you can get 10-15 turns coming back down. Continue along, passing The Nublet on your left, along a stunning alpine plateau, staying well clear of the avalanche slopes on your left and the hidden cliffs on your right. Our map shows where we broke trail, however the actual trail changes depending on where the most recent group put the trail in. Work your way out on this trail, passing to the right of Nub Peak. While it looks great to head off to the right, don’t do it. There are some massive cliffs there. After about 4km you reach a clearing that is very strangely shaped. There are some big rises and falls in this clearing, and as you can see on our map we contoured around this and continued to the far end, where we went a bit farther in a clearing before finding a low-slope run down through well-spaced trees. From the bottom we headed back towards Assiniboine Lodge in a large valley. The winter trail is close to the route of the summer trail. Take care in one small canyon and space yourself well in case there is an avalanche. Eventually you will find more ski tracks from those who skied down from The Nublet and you can follow these back to Assiniboine Lodge and then onto the Naiset Huts. 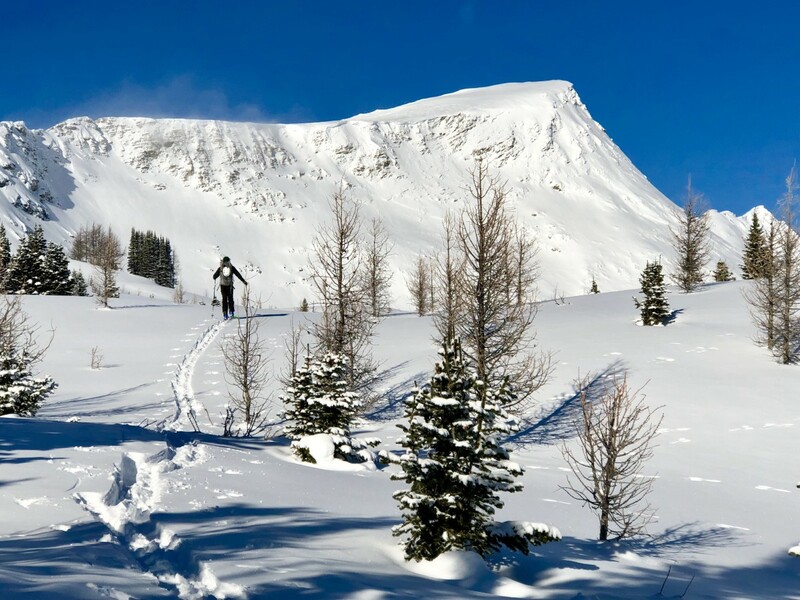 Wonder Pass is a great hike and a fun ski or snowshoe trip. It’s a perfect distance for your first afternoon, at roughly 6km roundtrip. Our map also shows a trip over to some glades that offer good skiing through tight trees if you want to get some turns. From the Naiset Huts, head SE towards the visible pass between The Towers and Wonder Peak. The trail is usually well-tracked since it is so popular. The trail goes through trees with a few open sections before coming to Wonder Pass. You can find a couple of turns coming down, but this is definitely not the place for great turns. Our map shows a continuation from Wonder Pass down to a small area of glades that are past the Naiset Huts and down from Assiniboine Lodge. 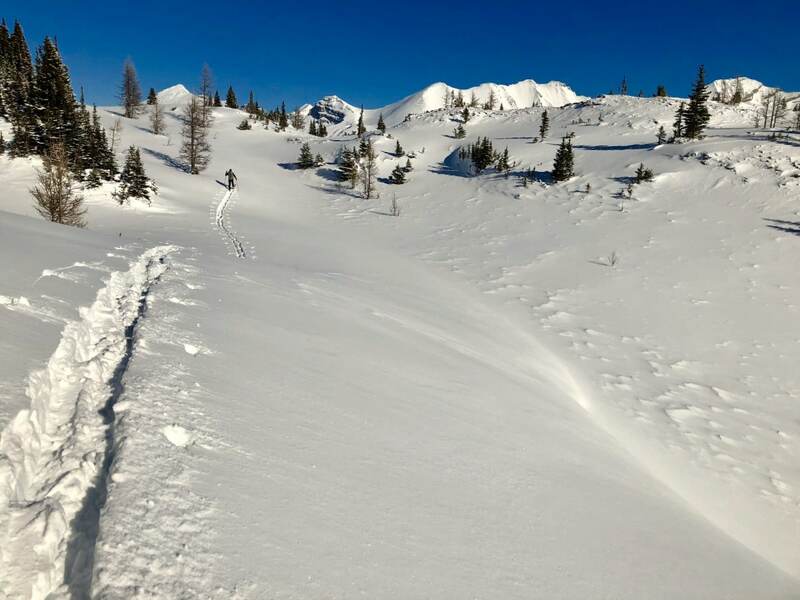 These glades are only suitable for some turns when avalanche conditions aren’t bad, and you should definitely have avalanche training and gear. This small area gives you roughly 80m of elevation gain to get a few turns in. In total this trip is 8.8km with 300m of elevation gain. It usually takes 3 hours, but it’s easy to spend more time in the trees when the conditions are safe. Everybody should ski-out of Assiniboine once in their life. It’s a fun ski out, though not without difficulty. The trip is 26.1km (if you’re skiing to your car at the Mount Shark Heliport parking lot) with 690m of descent and 325m of ascent. The trip took us just under 8 hours, with a 1h break at the Bryant Creek Shelter. We had AT skis with kick-wax, which are slower than a light touring set-up. With light-touring skis you could do this trip in about 6h, however you may have to walk a bit from Assiniboine Pass. Personally, we wouldn’t want to do this trip if we were breaking trail the entire way, as it would be challenging physically, and route finding could be tough. In addition, there are some tricky sections descending from Assiniboine Pass, where we are glad to have our helmets in case we take a tumble. We used AT skis and wouldn’t want to do it in Light Touring skis as the lack of control would make us feel unsafe. Most people on light touring skis walk the route down from Assiniboine Pass. To get on the trail to ski-out from Assiniboine, head over to Assiniboine Lodge. Follow a path that goes around the left-side of the lodge and you will follow markers for “Assiniboine Pass”. The trail heads north before curving over to the east, where you come to a meadow just before Assiniboine Pass. From Assiniboine Pass it’s a tricky descent, and we recommend putting on your helmets here. You will descend some steep switch-backs that at times are narrow and you can’t snow-plow. This makes it tricky and could result in a wipe-out or two. Coming down from the pass takes about 30-45 minutes. Another 3 hours of skiing should take you to the Bryant Creek shelter over a trail that is up-and-down. There are wonderful views along this part of the ski trip. Bryant Creek shelter is to the right of the ski trail, just after you see the beautiful Bryant Creek Ranger buildings. While some people love Bryant Creek Shelters, we don’t. These are spartan, and you have to bring everything, including food, cooking utensils, stove, sleeping pad. This is a place to camp out a night, not relax for a weekend. From the Bryant Creek shelter there is a big downhill and from there the trip is a slog, with limited views and fairly flat trail. In 90 minutes from the Bryant Creek shelter you’ll reach the end of the Watridge Lake Trail. While it’s groomed here, that doesn’t mean it’s fast. You’re going to be heading uphill most of the time from here on, with a few short downhill sections. This section is the worst part of the ski-out on AT skis, and you’ll be wishing you had XC skis and didn’t have a big backpack on your back. Expect to take another 90 minutes to get to your car from this trail if you have AT skis on here. The worst part is that once you finally reach the Mount Shark parking lot you have another 20-30-minute uphill ski to the Mount Shark Heliport. If you’re on a guided trip, and conditions are good then a trip up to Ely’s Dome is a wonderful journey. It’s a tricky slope that avalanches regularly so not a good option without a guide.